Solidification of olive oil in the fridge doesn't indicate quality, says Paul Vossen, UC Cooperative Extension advisor. “Wouldn’t it be nice to have such a simple test that could indicate an olive oil’s market grade, but it is much more complicated than that,” said Paul Vossen, UC Cooperative Extension advisor in Sonoma and Marin counties. The fridge-test theory surfaced on a recent episode of The Dr. Oz Show which aired Feb. 11, 2013, to more than 3 million viewers. While cautioning his method isn’t fool-proof, Dr. Oz. encouraged viewers to test the purity of EVOO by seeing if it solidifies in the fridge. Olive oils are graded based on how the oil is extracted from olives and on chemical and sensory standards. True extra virgin olive oil is extracted from olives without heat or chemicals and must have no defective flavors such as rancidity. Extra virgin olive oil is more expensive than other oils and is therefore an attractive product for fraud. 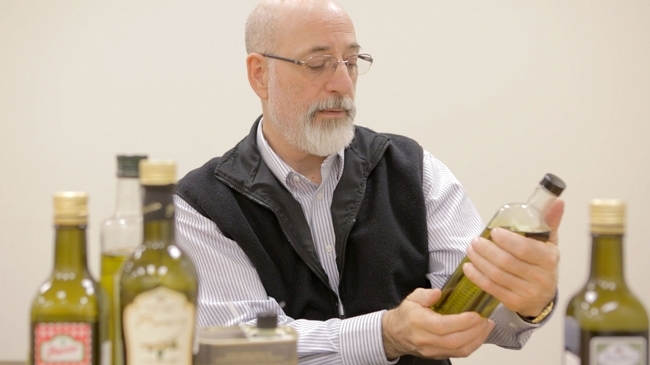 Using sensory and chemistry testing, the UC Davis Olive Center is working on dependable methods for detecting when an extra virgin olive oil is fraudulently labeled. In the meantime, the center advises consumers to choose an oil within 15 months of the harvest day (not the best-before date), look for a certification seal indicating that the oil passed chemical and sensory tests, and seek (and store) oils protected from light. A farm advisor who has been instrumental in developing profitable niches for farmers was named "Outstanding Agricultural Educator" with a 2012 Pedro Ilic Award, for his dedication to small-scale farming. 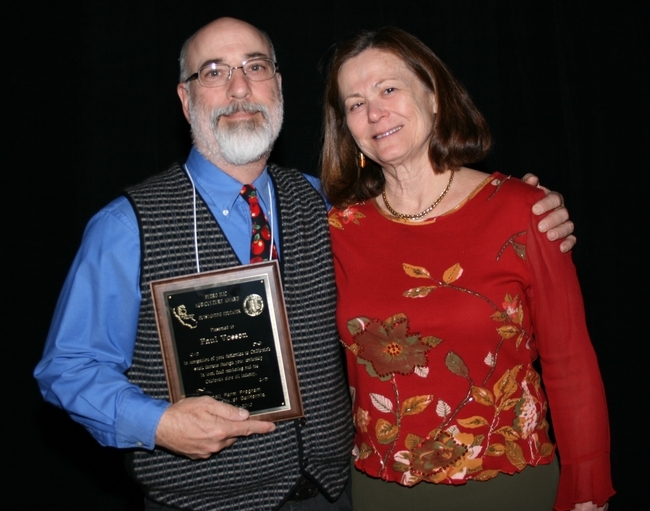 Paul Vossen, UC Cooperative Extension advisor in Sonoma and Marin counties, accepted the award on March 5 at the California Small Farm Conference in Valencia. "Paul has contributed tremendously to the success of the growing California olive oil industry," said Shermain Hardesty, who presented the award and is director of UC's small farm program. "Paul helps farmers connect with consumers who are willing to pay the price premiums necessary for their high-quality products. And he was one of the first to recognize 'local' as a marketing attribute." Vossen is one of the founders of the UC Davis Olive Center. He was also instrumental in the first organic production manuals published by the university, which were for apples and olives. He conducts field research on specialty crops, including tree fruit, berries and vegetables, to share with farmers in his region and throughout California. Vossen was nominated by Stephanie Larson and Linda Garcia, current and past directors of UC Cooperative Extension in Sonoma County. "Paul Vossen has passion, energy and enthusiasm for his profession and his clientele," they wrote. "He easily moves from teaching farm workers to discussing olive oil production with an olive grower visiting from Spain." Vossen knew and worked with the award's namesake, Pedro Ilic. "One of the really neat things about Pedro was that he was so passionate about the small farmer, and I really think that's why this award lives on," he said. "He was such a hard worker and so dedicated to the small farmer." Ilic's untimely death in 1994 prompted the UC Small Farm Program to annually honor those who carry on his legacy of personal commitment to small-scale and family farming. Ilic was a UC Cooperative Extension farm advisor in Fresno County and one of the original advisors of the Small Farm Program when it was established in 1979. Pedro Ilic Award winner Paul Vossen (left) with Shermain Hardesty.